SAN FRANCISCO – Yet another study shows that the states with the toughest gun laws have the lowest rates of gun-related deaths, while states with weak gun laws have the highest rates of gun deaths, State Sen. Leland Yee (D-San Francisco/San Mateo) said Jan. 2. The latest study – released by the Law Center to Prevent Gun Violence – shows that of the six states with the lowest per capita gun death rates (Hawaii, Massachusetts, Rhode Island, New York, New Jersey, and Connecticut), all had some of the toughest gun laws in country. In contrast, the top 10 states with the highest per capita gun death rates (Alaska, Louisiana, Montana, Nevada, Arizona, New Mexico, Wyoming, Tennessee, Alabama, and Mississippi) all had weak gun laws. 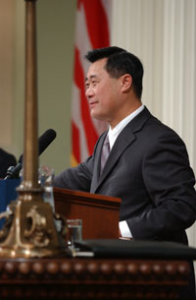 Yee’s SB 47 is modeled after a bill he introduced last year but that was held by the State Assembly. The bill prohibits semi-automatic weapons like AR-15s and AK-47s from having devices known as “bullet buttons” and “mag magnets,” which allow the gun to be easily reloaded with multiple rounds of ammunition. SB 47 also prohibits add-on kits that allow high-capacity magazines. Yee is also planning to introduce legislation that will toughen safety requirements. Current law only requires that gun owners own a trigger lock or safety lock box for their weapon, but doesn’t require the safety device to be used on an idle firearm. Yee’s bill will require that all guns have a locked trigger and be properly stored in a lock box when not in use. This country is in trouble when a prostitute cruising, shoplifter can get elected and then is able to use his warped sense of right and wrong to limit real Americans civil liberties. Leeland please go back to whatever 3rd world country you came from. Mr. Yee does a good job of picking and choosing. How does he explain Illinois, the District of Columbia, and his own home state?. Sure, he uses per capita numbers, but those look pretty unrepresentative when you consider the city of Chicago alone had more murders alone last year than my entire state of Washington. WE all know about Detroit. Why is Michigan ahead of ahead of Texas? “Gun Deaths” is a misleading statistic. It includes suicide, justifiable killing, police shootings as well as homicides. Mr Yee mines whatever bogus conclusions he can, knowingly misleading people to make a name for himself. Lee uses a silly and loaded metric “gun deaths”. It is not “gun deaths” that are important, it is overall preventable deaths. To illustrate how silly this is, you could use the metric “hospital deaths”. Countries with more hospitals have more deaths in hospitals. To eliminate hospital deaths, simply eliminate hospitals, then you will not have any hospital deaths. Guns are used to save lives as well as to take them. That is why police have them. The fact that those who wish to disarm the population have to resort to this sort of disreputable statistical trick shows how bankrupt their arguments are.